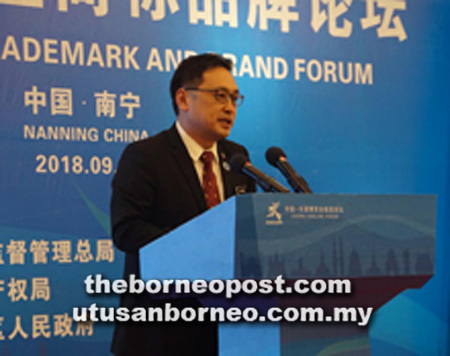 Deputy Minister of Domestic Trade and Consumer Affairs Chong Chieng Jen highlighted several important points in order to improve on Malaysia’s intellectual property (IP) system such as the proposed amendment to the Trademark Act 1976 at the recent China Asean Trademark & Brand Forum held in Nanning, China. He said in a press release that the improvement will enable Malaysia to accede to the Madrid Protocol that will benefit us economically by enhancing confidence among foreign investors of the country’s business environment. Chong also emphasised the country’s commitment to set up a proper and transparent criteria for IP valuation in order to recognise IP asset value as collateral. The forum was hosted by the government of China in collaboration with the State Market Regulatory Administration (SMRA) and the People’s Government of the Guangxi Zhuang Autonomous Region. Several ministerial-level participants from Asean countries such as Cambodia, Indonesia, Laos, Vietnam and Thailand also attended the discussion. The main objective of the event was to discuss and exchange ideas pertaining to trademark and intellectual property development between Asean countries for the benefit of the regional grouping.